It began with the affordable MC200 which prompted a followup review of the MD600/MS600 which in turn made me wonder what is possible in the wonderful world of Sooloos (now Meridian Streaming Audio) when cost is of no concern. 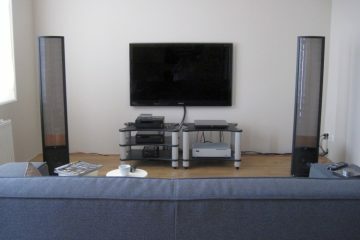 Review sample kindly supplied by Dutch distributor Viertron. True, the 808.3 is marketed first as a Signature Reference CD player. 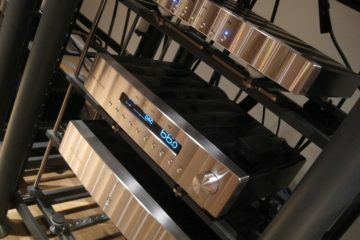 But it also offers 3 coaxial and 2 optical digital inputs, in addition to 6 stereo analog inputs, and of course has switchable volume control (whether digital or analog I cannot confirm at this stage) with analog outputs on both cinch and XLR, which means that it can drive a poweramp directly. What makes it even more interesting is that it includes an ID40 Sooloos card that transforms it into a highend Sooloos (now Meridian Streaming Audio) zone, or a ‘source’ in Meridian speak. Because the 808.3’s Sooloos functionality is almost identical to that when using the MS600 as endzone, please see the MD600/MS600 review for the Sooloos specifics. While the 808.3 with its ID40 Sooloos card offers all the functionality that the MS600 offers, it does offer some extra functionality. For starters, there is now a front panel display and control buttons. Also, the play queue can be operated via the supplied MSR+ ir remote control. The display only shows audioformat and samplerate, not track titles. The front panel controls operate play/pause, previous and next. If you like, you can also control volume, either on the 808 itself, or relayed to the internal volume control of attached active digital Meridian speakers. Before moving to the 808.3, to make sure that my ears were properly aligned, I first listened to various tracks on my MS600 with the Furutech Alpha 3 powercable. The MD600 (media drive) had now been moved to the left rack to make room for the big 808.3 to be on top of the main rack. This move did make the MS600 sound different, or rather, made the MD600 sound different, because adding a weight on top of the MS600 did not provide the same sonic benefits as when the MD600 was op top of the MS600, so apparently it was good for the MD600 to be on top of it all. Still, setup on the lower left rack, the MD600/MS600 combo had that recognisable sound: full-bodied (if slightly less so with the MD600 in a different position) enthusiastic, lively, fast and smooth, with a big soundstage and lots of drive. In the mean time the 808.3 had been powered on, but sitting on the floor. Moving the MS600 out of the way and letting the 808.3 take its place on top of the rack, using the same powercable, interlinks and network cable, the sound was quite different, but at the same time portraying strong family resemblance. Still there was the smooth frequency balance: everything there, nothing sticking out, and transparency in spades. But it was a more polite sound, more refined, mostly evident in the treble, which was so much more gentle and had apparent greater resolution. So did the rest of the frequency band by the way: in fact the 808.3 made me think of the Linn Klimax DS1’s awsome resolution. I think that it comes really, really close, while offering a much bigger soundstage and better phantom images. The 808.3’s center focus really is something you have to experience before you know what true holographic sound is: it hugely declassifies the Levinson 390S on that aspect. What was also evident is that the 808.3 has tight and articulate bass, perhaps even more tuneful than the MS600, but also quite a bit thinner. Also different from the MS600 was the projection in the midrange, the sense of acoustical instruments having body and mass was a bit diminished. Not that they lacked authenticity, but I had grown fond of the MS600’s greater attack and drive. At this point I remembered an English hifi magazine stating that the 808.3 is perhaps more a player for the head than the heart. Would that really be so? But I wasn’t going to leave it at that of course. After all, I had done exacty zero effort at tuning the 808.3. It turns out to be a different animal than the MS600 and as such one cannot expect it to perform 100% straight away. 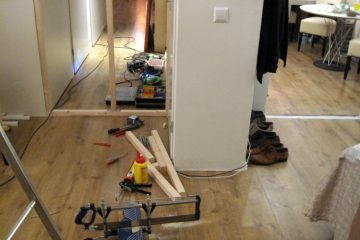 First up for a check was the position of the Furutech Alpha 3 powercable in the extensionblock. Up until now it had been somewhere near the end, after the preamp and other sources. I figured that if the 808.3 needed some extra slam, most likely it would benefit from being fed more from the front position of the extensionblock. And indeed this mattered, a lot! Now it sounded faster, more articulate and had better slam. But it went at the expense of treble fluidity and it lost some of its naturalness. No, this wasn’t it either. 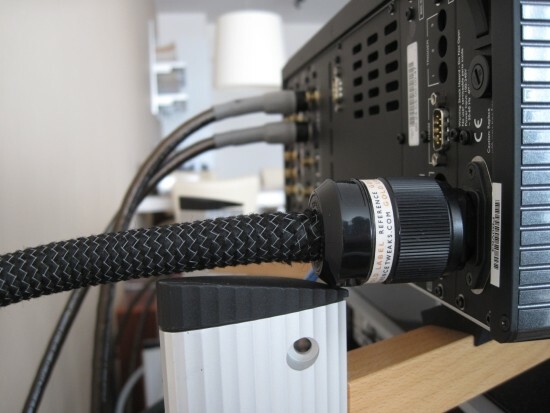 I swapped the standard Furutech powercable for my new favorite Reference Tweaks Gold Label powercord thinking maybe this would improve matters somewhat. Well, I got what I wanted, and more: bass became much fuller, not entirely MS600 territory but now being enough, midrange opened up, gained a real acoustical, live, breathing quality and also now had excellent slam. But the treble became slightly dry. So the Reference Tweaks powercable moved back to the back of the extensionblock, allowing for some Rowland-smoothing, and bingo: this was it. The perfect combination of smooth treble, rich midrange and full bass, all combined with an elegance that is rare in digital. There was no edge, no hardness. What’s more, there was absolutely no feeling of listening to what in essence is a computer source. The 808.3 manages to combine the big soundstage and foot-tapping PRAT of the PS Audio PWD MKII with the fluidity and air of the Levinson 390S and the transparency and low level detailing of the Linn Klimax DS/1. Within one hour I knew that the 808.3 was so much better than the MS600 that it hurts. My wallet that is. 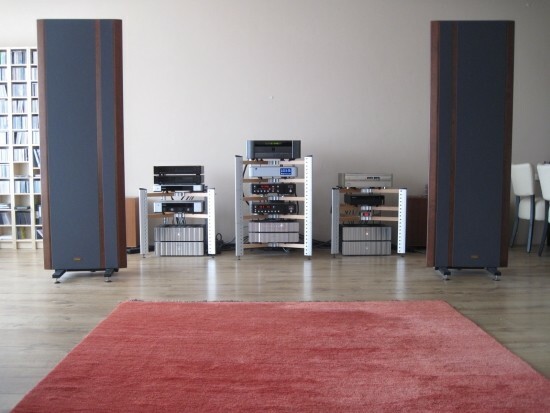 The one and only aspect in which the MS600 was still better was the bass, which was simply big ‘n ballsy, almost equalling the awesome bass for which the Levinson 390S and Wadia S7i are known. But after assessing the 808.3’s CD player performance, I would discover how this aspect, too, could be tweaked. Right from the first CD that I played on the 808.3, I liked it. The sound is always emotionally engaging, always fluid and relaxed, but never dull, or slow or veiled. The very same review I spoke of earlier, mentioned the 808.3 sounding so very transparent that it could be too much. I don’t agree. Sure the 808.3 has a hi-rez sound, but it is never in your face, never agressive. The fun thing was that now for the first time I could compare CD versus streaming in the very same housing, using the same power supply, dac and output stage. This was the moment of truth. Would CD sound the same? Better? Worse? In fact, CD performance was both better and worse than streaming. Better was its freedom, the sound flowing naturally from the speakers. Treble fluidity is simply exemplary. Not as good was its bass performance: quite thin and lacking drive and attack. Still, it was well-paced and very engaging, reminding in more ways than one of the Ayre CX7 CD player, only better, mostly in terms of emotional engagement. On another level, for neutrality, the 808.3’s CD sound reminded me of the older Meridian 507, only much more fluid and engaging. 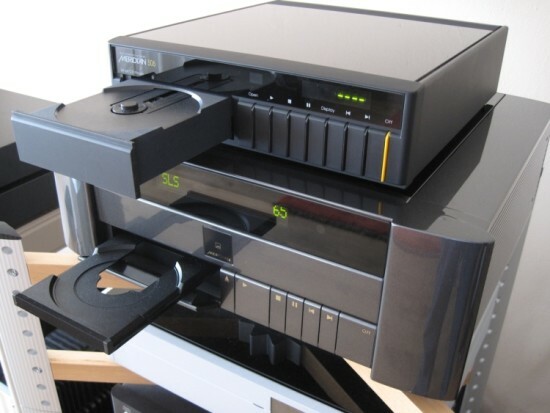 Although the transport is a standard CD/DVD rom drive, and by nature its drawer doesn’t really fit a player in this price range, it operates quickly and reliably. Changing track is instantaneous and there are two searching speeds. Like with the Wadia S7i, you don’t have to hold the search button down but only have to click it once, then click play when the point you’re searching for has been reached. Very convenient. It was at this stage that I started wondering whether the CD player part might need different tweaking than the Sooloos part. I moved the rubber Spider feet more toward the outer edges, thereby making less use of the Spider’s struts’ flexing. 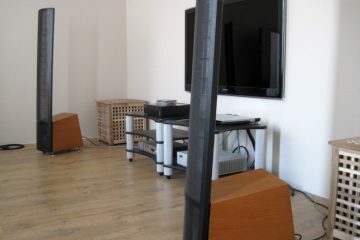 And what a difference it made: bass firmed up and the midrange became more acoustical. Still, the overall sound tended towards lean but it was never anything less than engaging. Especially full-sounding cd’s were spot on, and I couldn’t find a cd that would provoke the 808.3 to sound agressive. When switching back to Sooloos mode, I now noticed how full the bass was. It was as if I was listening to the MS600, only with much better transparency and resolution. But… didn’t the treble now sound a little less fluid, less airy? Indeed, moving the rubber Spider feet back made for more fluidity at the expense of some bass fulness. I guess there’s no pleasing both modes with the 808.3. Use it mainly for CD? Then make sure that it sits firmly, perhaps not on a Spider rack but something more solid. Using its own soft feet might not be a good idea, and I would recommend using Ceraballs or similar hard-coupled feet. Conversely, use it most for Sooloos replay? Then it allows you to mellow circumstances, use (its own) soft feet and a more springy foundation. The 390S on its own is harmonically fuller, with richer bass and a more mellow character than the 808.3. But the 390S doesn’t have the 808.3’s transparency or bouncy PRAT. Using the 390S as a transport into the 808.3 makes for a surprisingly small difference in overall character: tempo is comparable, soundstage stays big, but focus improves and resolution seems higher, although the entire impression is of a less luxurious sound. Overall this transport-DAC pairing is very good, but playing the same CD in the 808.3 directly is more joyful, with better detaling and a more authentic feel. Using the 506.24 as a transport into the 808.3 is not spectacular. It is plenty smooth but the overall feel is of a restrained, small, undynamic sound. In this case the 506.24 on its own is much better. Not better than the 808.3 mind you, but better than the transport-dac combo. On its own the 506.24 is admirably smooth and easy going, but it can’t begin to match the 808.3 for transparency, PRAT, extension and high-end feel. The 808.3 on its own sounds better than any combination I made. It seems that once more an integrated player beats a transport-dac combination when using plain sp/dif. Although I wouldn’t be tempted to say goodbye to my Jeff Rowland Coherence II preamp, naturally I had to try the 808.3’s analog input capabilities. The manual is unclear about this, but given that the 818 (sort of an 808.3 minus CD transport) digitizes the inputs, I would gather that the 808 does this too. 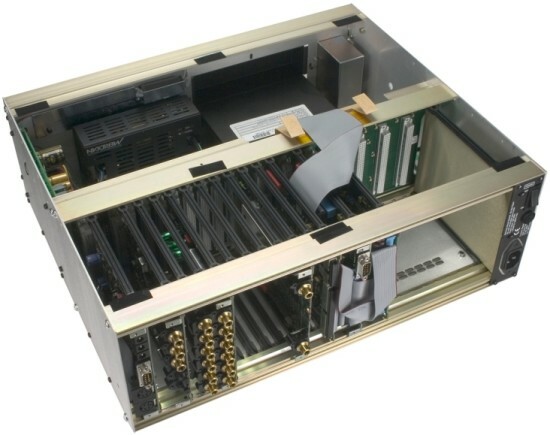 After all, internally it is based on modular digital bus-connected cards. 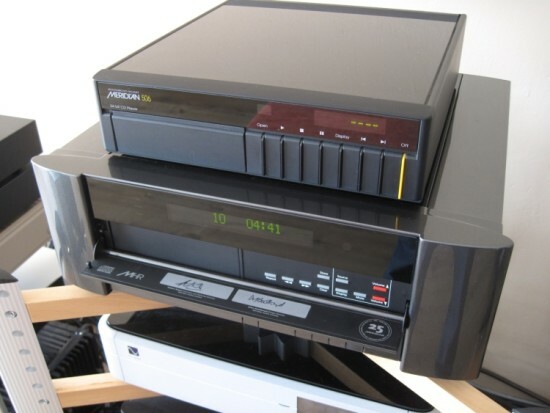 This means that when you connect another CD player using its analog output and the 808.3’s analog inputs, the signal goes D-A, A-D and D-A again. Can’t be good, right? Well, whenever I’m convinced of something based purely on instinct, I just got to try it out! Guide”. There are 6 stereo analog inputs, three coaxial digital inputs and 2 optical digital inputs. Outputs are analog on cinch and XLR and digital on cinch, in addition to dual speaker link outputs capable of outputting 24 bits 88.2kHz. I setup the Meridian 506.24 on top of the 808.3 and first listened to it, connected with a Furutech Alpha 3 powercord and Cardas Hexlink cinch interlink. Confirmed: this was the familiar refined, smooth and friendly 506 sound. I then moved the Cardas Hexlink to the 808.3’s outputs and connected the 506.24 to the 808.3 using standard cables. The 808.3 remained in fixed output mode. The resulting sound was surprisingly good and at first seemed even better: soundstage was all still there, maybe it was now even wider, bass was just as full but a little more articulate and rhythm was entirely unaltered. Even the tonality and treble were almost indistinguishable. What was different however was the dynamic swing: the 506.24, for all its smoothness, does portray dynamic swings in all their glory, going from silent to loud with gusto. For this, I find it dynamically and emotionally more engaging than the more precise AD-DA’d sound of the 808.3, even if the latter was just as tight, fast and articulate. Don’t confuse the sound using the analog-inputs with the sound of the built in CD player though, because the 808.3 on its own sounds better than the 506.24 in every aspect: faster, more agile, livelier, more dynamic, while maintaining smoothness and fluidity. For practical reasons, I did not test the 808.3 connected directly to the poweramps, bypassing my own preamp. But I have no doubt that it would work well and could replace many a dedicated preamp. The ID40 Sooloos card can be configured by entering its IP address in an internet browser. Unlike for the MS600 however, for the 808.3 there is no provision for sample rate setting, but you can change the device name or select a static IP adress instead of DHCP. Having the least used buttons behind a flap makes for an uncluttered front panel, but having to open the flap each time when you want to change sources seems unhandy. Likewise, track search is available behind the flap, but when it is open, you cannot easily access the normal transport buttons because they are visually covered by the flap. 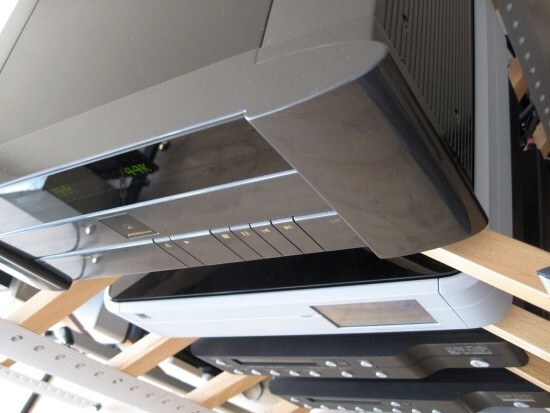 The flap should move inwards, more like those on Yamaha surround receivers, so that it is out of sight and out of the way, should one choose to keep it open for a prolonged period. The front panel display indicates audio format, but dispays WAV, AIFF and FLAC all simply as PCM. It displays sample rate, but not bitrate. Also there’s no album/artist/track information so that you’re operating more or less blind when using the front panel buttons or the ir remote. The Sooloos system offers the absolute best user interface for streaming audio but like all software it isn’t without flaws. Most annoying for me are the inability to add tags or album picks directly from the Album Info screen on the Core Control iPad app and some issues I have with importing anything other than complete CD’s. After hearing the MS600 I thought that Sooloos couldn’t get any better. I was so convinced that I bought the unit. But the 808.3 has changed things again. Already I found the MS600 sound to be more engaging than the Linn Klimax DS/0 but from recent memory, I think it is safe to say that the 808.3 with its ID40 Sooloos card even performs at the level of the Linn Klimax DS/1. I will try to perform a direct comparison to see if my memory serves correctly and post the findings here. Placing the DS/1 aside for the moment, the 808.3 is my new reference streaming device, bettering anything I have heard, including the Linn Klimax DS/0, Naim NDX and PS Audio PWD MKII. 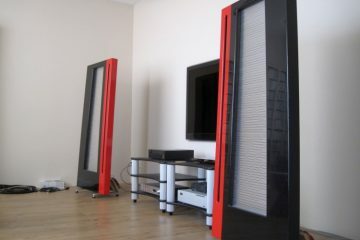 The Sooloos sound is big, luxurious, smooth, finely detailed, airy, articulate and very involving. 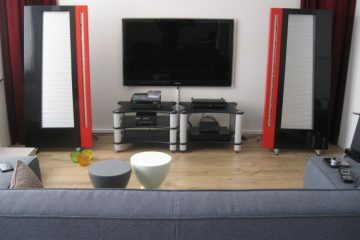 Add to that a detail level and transparency that challenge the Linn Klimax DS/1 and what we have here is a winner. 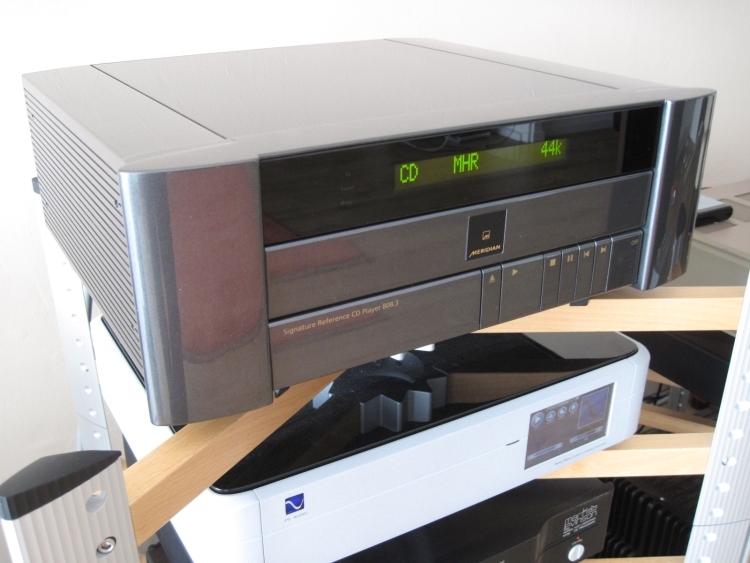 The PS Audio PWD MKII was the first streamer to challenge the best CD players (Levinson 390S, Wadia S7i) and the Meridian 808.3 goes further still. It consistently sounds just as good as my favorite CD player, with some mediocre CD’s sounding better on the 390S and some well-recorded CD’s sounding better on the 808.3 (in Sooloos mode). I’d say it is a tie. At last, streaming audio performs just as well as CD on the best CD players, not only technically, but, importantly, also emotionally. The 808.3 in Sooloos mode manages to combine the big soundstage and foot-tapping PRAT of the PS Audio PWD MKII with the fluidity and air of the Levinson 390S and the transparency and low level detailing of the Linn Klimax DS/1. An amazing achievement. CD player sound is also impressive but it requires some tweaking to sound more like the 808.3 in Sooloos mode. Especially the transport’s bass can be thin and the overall sound can lack slam. 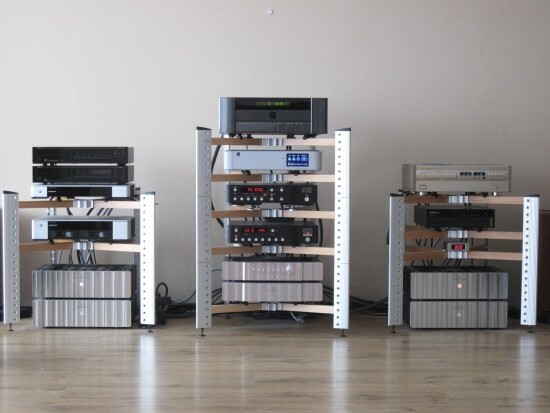 But when compensated for this (using hard-coupled feet and appropriate powercable and interlinks) the CD player simply sounds gorgeously organic and free flowing. It is at once fluid, open, airy and emotional. Some people may find its transparency a bit much but I can assure you that in spite of the high resolution, the sound is absolutely never brittle, forward, dry or sterile. A friend found the 808.3’s CD sound more continuous and airy in the treble, I found the Sooloos sound more solid, dynamic and full-bodied. I guess we’re both right. And the 808.3 simply sounds fantastic in either mode.